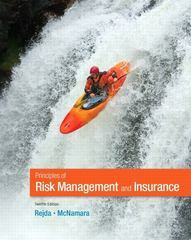 Principles of Risk Management and Insurance 12 Edition Intended primarily for undergraduate courses in Risk Management and Insurance, this text also provides practical content to current and aspiring industry professionals. Principles of Risk Management and Insurance is the market-leading text, focusing primarily on the consumers of insurance, and blending basic risk management and insurance principles with consumer considerations. The twelfth edition provides an in-depth treatment of major risk management and insurance topics. Coverage includes a discussion of basic concepts of risk and insurance, introductory and advanced topics in risk management, functional and financial operations of insurers, legal principles, life and health insurance, property and liability insurance, employee benefits, and social insurance. In addition, the new Affordable Care Act is discussed in depth.